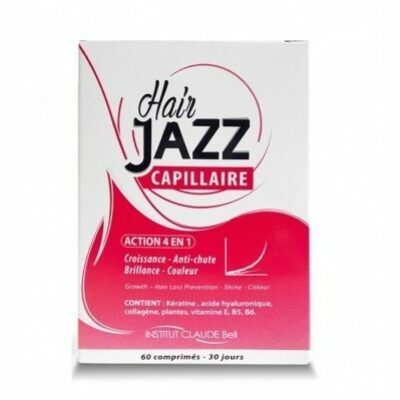 HAIR JAZZ is our brand new plant-based food supplement formulated with nutrients, hyaluronic acid, collagen, amino acids and keratin for 4-in-1 action: growth + hair loss prevention + shine + hair colour. HAIR JAZZ is your best friend in helping you give your hair and nails a new dimension of beauty, thanks to its innovative formula. Nutricible 111 Apple (flavan-3ol-based active ingredients) contributes to eliminating free radicals in order to fight against the premature ageing of hair and stimulate peripheral microcirculation, thanks to the combined action of blueberry extract. Wheat protein hydrolysates combined with bamboo rich in silica, provide the ingredients essential to form the keratin required to develop new hair fibres. There is a correlation between shiny hair and the perfectly smooth and flat outer layer of the keratin cuticle scales that are tightly bound together, which reflect light. Consequently, the proper synthesis of keratin is essential to give your hair what it needs. Vitamin E ensures antioxidant protection and vitamin B6 participates in the synthesis of cysteine (an essential element of keratin). Zinc, combined with amino acids, contributes to beautiful hair by enabling the proper synthesis of keratin. As for Nutricible Beauty, its active ingredient is a complex that concentrates three essential elements of the skin and scalp (Collagen – Keratin – hyaluronic acid), guaranteeing soft and dense hair nourished from the scalp! Vitamin E: Contributes to protecting cells against oxidative stress. A significant reduction was observed in terms of hair loss during the tensile test (removal) (p<0.001) with an average loss of - 72% on average, and this effect was observed in 100% of the volunteers. These results support the claim that the HAIR JAZZ treatments make hair twice as strong, or give it twice as much vitality. Two tablets in the morning with a large glass of water. 60 pills. The net amount is 789 mg (1 pill – 13.15 mg). Ingredients: Nutricible® Beauty (dicalcium phosphate (anti-caking agent), marine collagen hydrolyzate, hydrolyzed keratin, hyaluronic acid), L-cystine, magnesium carbonate, microcrystalline cellulose (anti-caking agent), Nutricible®111 Pomme (apple pectin), Nutricible® Pomme OPC (apple powder), tricalcium phosphate (anti-caking agent), whey protein hydrolyzates (12% cysteine), magnesium stearate, bamboo shoot (Bambusa longispiculata) extract, DL-alpha-tocopherol (vitamin E), niacin (nicotinamide), biotin (d-Biotin), blueberry (Vaccinum myrtilius) extract, zinc oxide (7.5 mg of zinc), pantothenic acid (calcium D-pantothenate), copper gluconate, pyridoxine hydrochloride (vitamin B6), maltodextrin. I love Harmony life products. I am using jazz shampoo ,vitamin and lotion. I would buy more often but the delivery is so expensive what a shame.